A friend who I often disagree with about movies recently surprised me with a recommendation. His opinions are often very stringent, yet here he was telling me that Roy Del Ruth’s The Alligator People was worth seeing. Del Ruth had a long and prolific career, but his filmography seems fairly undistinguished – just one more of those studio workmen who kept the product flowing for the front office. As far as I know, the only other films I’ve seen by him are It Happened on 5th Avenue (1947), a Christmas movie about the gathering of a community of displaced WW2 vets and their families in an abandoned mansion in New York; and the original 1931 version of The Maltese Falcon, a breezily paced adaptation with many similarities to John Huston’s classic, although of course it lacked that film’s impressive cast. 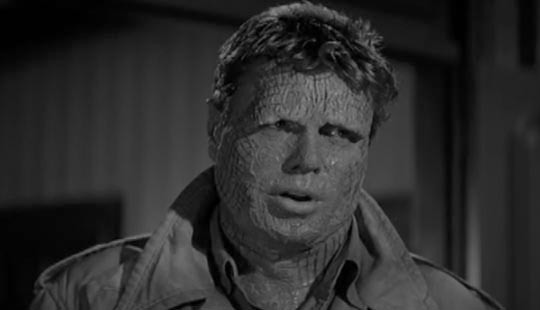 The Alligator People (1959) was Del Ruth’s second last feature, after spending the previous few years working in television. I’d always been under the impression that this was just another wretched low-budget effort like Ray Kellog’s ridiculous and boring The Killer Shrews (1959). Bill Warren is what you might call “polite” about it in Keep Watching the Skies!, but seems to strain to say nice things. He points out that it was whipped up quickly to fill a double bill with Edward Bernds’ Return of the Fly, and it seems plausible that it started with the title and writer Orville H. Hampton concocted the story to justify the name. So I started watching it with pretty low expectations despite my friend’s recommendation. 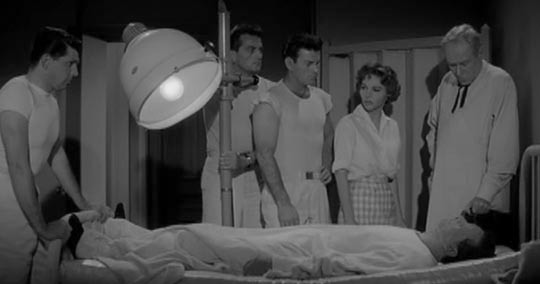 The movie begins in the office of Dr. Lorimer (Bruce Bennett), who calls in his colleague Dr. MacGregor (Douglas Kennedy) to observe a session of hypnosis with cheerful nurse Jane Marvin (genre stalwart Beverly Garland) who apparently has some suppressed memories. The bulk of the movie is a flashback to a missing year in her life when she married a vet named Paul Webster (Richard Crane) only to have him vanish on the way to their honeymoon. Her quest to discover what happened to him ultimately leads to a dank, remote southern estate built in the middle of a gator-infested swamp. Despite the atmosphere of heavy menace, it turns out that Sinclair is not exactly a mad scientist; he’s just been trying to use hormones from reptiles to increase the human body’s ability to regenerate damaged organs and limbs. He used his treatment on Paul Webster when he was severely injured in a plane crash; his recovery was miraculous, but not without side effects … and it was when these became apparent just after his wedding that Paul fled. Despite his reptile skin, Joyce still loves him and she sticks around as the doctor attempts to use radiation to reverse the mutation … a process catastrophically interrupted by Manon. This is where the film earned its low reputation, because there’s no denying that the final monster suit is ridiculous and unconvincing. And yet despite falling short in the makeup department, by the end the movie has accumulated such a heavy doom-laden atmosphere that, while it falters, it still manages to work as a tragic romance. In fact, Del Ruth directs with sincerity and the script makes an effort to flesh out the characters so that the audience cares about them despite the silliness. And it certainly benefits greatly from the atmospheric widescreen black-and-white images of Karl Struss, whose career started in 1920 and included two features for Chaplin, a bunch of Tarzan films, and some of the most notable genre films of the ’50s (The Fly, Kronos, Rocketship X-M). 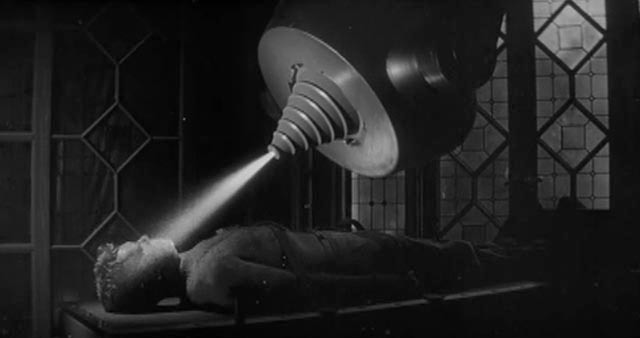 The photography certainly raises The Alligator People above the level of routine programmer and the script and direction give it the feel of a proto-Outer Limits story. 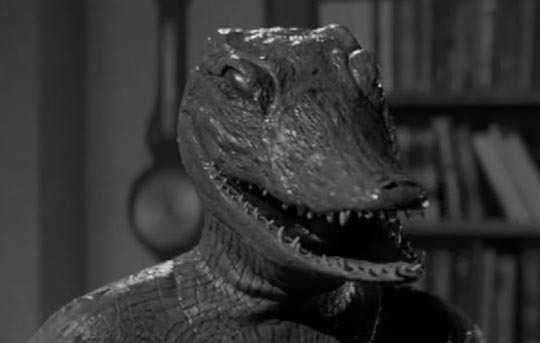 Bill Warren says “While not a film we can be grateful for being as good as it is, The Alligator People is nonetheless acceptable for being no worse than it is.” He complains that it’s morbid and depressing because there are no villains, just well-intentioned people whose efforts all get ruined by the actions of an angry drunk … personally, it was this grimness, the over-riding bleak hopelessness, that appealed to me and made me think that, actually, it really is much better than we have any right to expect with a title like that. So I am grateful – particularly to my friend for recommending it. This entry was posted in Review and tagged Directors, Horror, Science Fiction. Bookmark the permalink.